On day 3 of the Sierra Challenge we were supposed to do a roped climb of Petit Griffon on the Sierra Crest between Mts. Abbott and Mills. A week earlier, I had been alerted by Kristine who'd visited the area and reported most of the snow in the couloir leading to the formation melted out, leaving dangerous, loose rock conditions. Not wanting to take such a large party up there, I made a hasty change to our schedule, finding an unnamed 12,000-foot peak with 500ft of prominence, giving it a name and sending out a mass email. The peak lies about half a mile east of McGee Pass and 8mi from the McGee Creek TH. It had been some years since we'd used this fine trail, so it seemed a good time to give it another go. There were 20 of us at the TH for the 6a start, sunrise coming only minutes later. It was a beautiful morning with none of the smoke we'd had the previous day, evidently the winds having shifted and providing us a break. Within 15min, Scott turned right off the trail to head up to Mt. Aggie, the first stop in a big day for him. As usual, the group split up almost from the start and I did my best to try to keep up with the fastest folks who'd dubbed themselves the " Wolf Pack." There are two creek crossings that come near the end of the first hour, the first on a large, hewn log that has shifted from its original placement, the second a rag-tag collection of boards and smaller branches that suffice, barely. When some of the group paused for a break to remove extra clothing, I continued ahead but quickly lost the trail at a bend. Rob came following after me and the two of went on a cross-country power hike along the north side of the creek, involving some class 3 scrambling to get through minor cliffs and eventually back to the trail. Our route turned out to be a short-cut that got us ahead of a few others without us (or them) realizing it. We continued on the trail past Big McGee Lake and then Little McGee Lake as it rises above treeline on its way to McGee Pass. Upon consulting my GPSr I thought I might be able to shortcut the intended route by approaching the summit from the south. Just past Little McGee Lake, I spied a steep talus chute that appeared to rise all the way to the SE Ridge and headed up. It was incredibly tedious-looking, causing Rob and a few others to continue up the trail in search of a better option. I figured I'd be on my own for this route but spied someone else a few minutes behind starting up as well. It wasn't until I reached the ridgeline above that I recognized it to be Kristine. I waited for her to get through the last of the ugly talus and together we continued up the ridge to the summit. From the trail the ridgeline looks tough, but we found the northeast side to have easier going and within 20min we had reached the highpoint at 9:45a. Or so we thought. It was definitely the point on the GPSr which matched the point I'd shown on the Challenge website. But there was another point about 1/5mi to the NW that looked pretty close to the same. Further, we could see a handful of folks sitting about the other point and they were all looking at us. Clearly it had been the first point they'd come to when approaching from near McGee Pass, and I knew they would be wondering if they were on the correct point. For humor's sake, I suggested to Kristine that we should sit down for a few minutes in order to increase their doubts. I had picked the point on the topo map that had a spot elevation and matched the point on ListsofJohn.com, but that was no guarantee. I figured the best I could do was take a GPSr elevation reading, then go over and make a similar reading at the other point. While this was no guarantee either due to variations of the GPSr readings, it was the best we could do. After a few minutes we got up and started heading along the ridge to the other points. Clement was the only one from the other group that simultaneously started heading in our direction, the rest content to stay put. This would be fun. When Kristine and I got to the other point about 15min later, I jokingly chastised them for being on the wrong summit before acknowledging theirs may be the highpoint. I explained my decided-upon method for determining the highpoint for the Challenge based on my GPSr reading before I took the second reading. With baited breath they waited until I had read out the difference - theirs was 5ft lower. Groans went up while Kristine and I chuckled. Zach declared it to be stupid and there was no way he was going to risk injury along the loose, serrated ridgeline simply to tag a second arbitrary point. Mason pointed out that Bob wouldn't count the summit unless he did. I smiled, "Rules are rules." In the end, Zach went with the others to the eastern point. Clement had returned from the other summit before I'd left, so he joined Kristine and I as we headed west towards McGee Pass. I was intent on climbing the unnamed bonus peak south of McGee Pass while Clement planned to head to Red Slate Mtn. Kristine was unsure but ended up following him to Red Slate. I met some of the others still on their way to the summit, including Chris and Matt, while Clare had decided to turn back after finding the loose class 2-3 nature of the ridgeline unsuited to her comfort level. 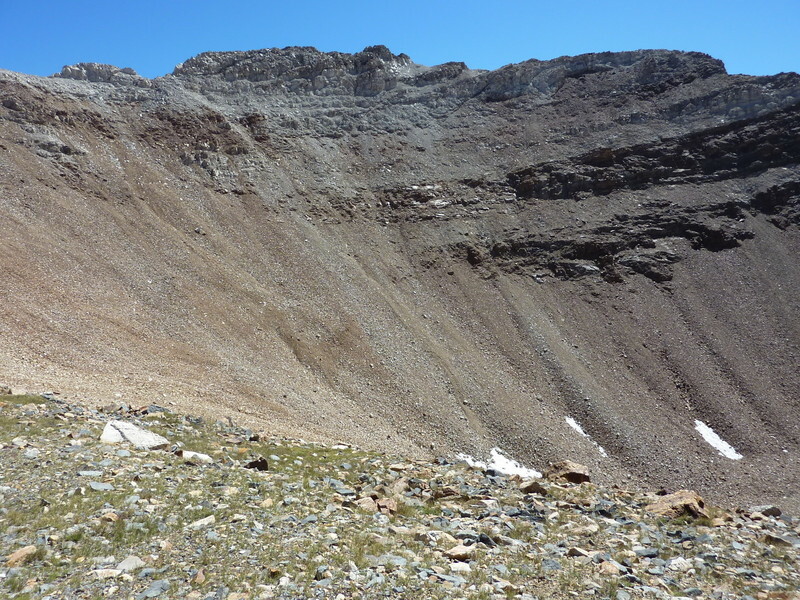 The ridgeline to Peak 12,418ft from McGee Pass is not difficult but a bit tedious, more of the loose talus stuff we'd seen on McGee Pass Peak (and would find on Red Slate Mtn, too). It would take a bit less than half an hour to make my way to the summit, about half a mile distance and 400ft of gain. I was happy to find a Barbara/Gordon register from 1984 with only 4 pages of entries, the last from Chris Kerth three years earlier. Later, Kristine would report that she had found the original Smatko register from the 1970s buried a little bit further into the cairn - seems not even Gordon/Barbara had seen it. I was sad that I had missed that. From the summit I continued south in the direction of Red & White Mtn. I wasn't really sure how far I would go since I'd already been to Red & White and there were no other bonus peaks enroute, but this was a small section of the Sierra Crest I hadn't traversed before and I was still having fun. I ended up at a saddle about 0.4mi from the summit where I found a string of snow fields heading down to Little McGee Lake that looked to make it easy for me to avoid the loose talus. This would work out quite nicely, getting me down to the lake in about 20min. It was noon by the time I returned to the trail at the outlet of Little McGee Lake and from there it would take me another two hours to hike back down the canyon to the trailhead. Zach, Rob and AJ had all beaten me back to the trailhead by a good margin. They were looking rather refreshed while I was a bit haggard and sweaty. While sitting in the shade of Rob's RV, I mentioned my my new idea to give a 10min time bonus to the first person to hand me a beer when I got off the trail. This had the desired effect of getting a beer in my hand pretty quickly (thanks, Rob) but I had to admit I couldn't really give the time bonus if the Yellow Jersey or Stage Win were at stake (and they were). It was one of the best beers I'd had since, well, yesterday at least. We would end up getting 16 folks to the Challenge peak today, quite a haul, and all would end up doing both summits.